More often than not, they meet with foul play. But sometimes they pop up alive and well someplace else suffering from amnesia or even, in a small number of cases ... they are as clearheaded and purposeful as the day they walked away. Boyce Luther Gulley was one of those who, it is said, had a tragic reason for abandoning his family: he was dying. There is an official and romantic explanation for why he vanished and a couple of versions of how he eventually died, but surely the most interesting mystery of all is totally obscure: How did he earn a living after he left his family? Who were his friends? How did he have the strength to do what he did all alone? How come he was so ... healthy? Well, the official account simply has no information about this, leaving much to the imagination of anyone who wonders not just about the amazing handiwork of this artist but of the secrets that appear to be buried with the man himself. Anyway, here is how the story goes: After being diagnosed with the much-dreaded Tuberculosis in 1929, Gulley decided to leave his family life in Seattle, Washington in order to spare his wife and little three-year-old daughter from being exposed to the deadly, contagious disease as well as from the agony of watching him die, a fate he figured would soon be coming. He never explained his departure or whereabouts for the fifteen years that followed. And somehow, by the grace of God, he did not die. 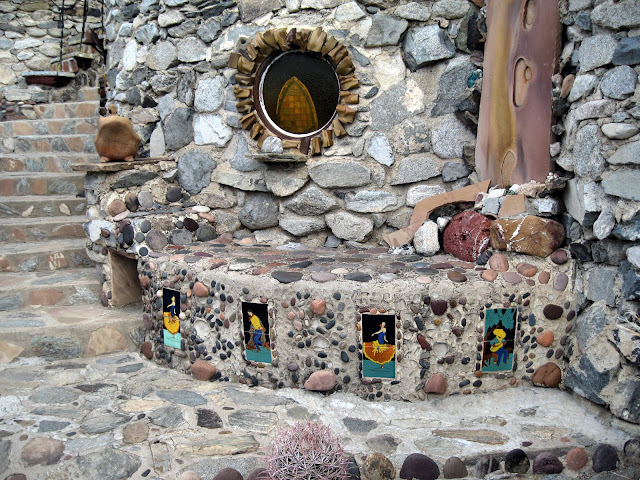 What made Gulley tick would be a fascinating psychological study because what we do know about him without any doubt is entirely and gloriously visible in the form of a sprawling and wondrous "castle" in the Arizona desert, and is evidence of a very, very eccentric individual. He spent the next fifteen years, apparently not being amazed that he was still alive, but instead relentlessly handcrafting a remarkable monument not only to his artistic prowess, but to the deeply felt love he had for his child: he always thought of Mary Lou as his little "Princess". In Seattle he had often played on the beach with her, building majestic sand castles over which she would temporarily reign as a princess. So this was truly a labor of love, it is said, undertaken to build his princess a castle that would never wash away. Gulley chose Arizona as his retreat destination and when he arrived in Phoenix in 1930, he purchased an 80-acre gold mining claim in the desert just outside the city and located adjacent to the town dump. He had a couple of years of architectural engineering under his belt from a college in Texas, plus enough artistic talent and creative drive to dredge up this marvel of a mansion with nothing but his bare hands and lots and lots of time. 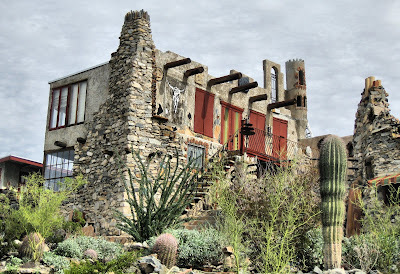 "The Mystery Castle" (so named in a 1948 article in Life Magazine) is the incredible result of Gulley's curious and lonely endeavors and it has become a famous Arizona tourist landmark nestling in the foothills of South Mountain. 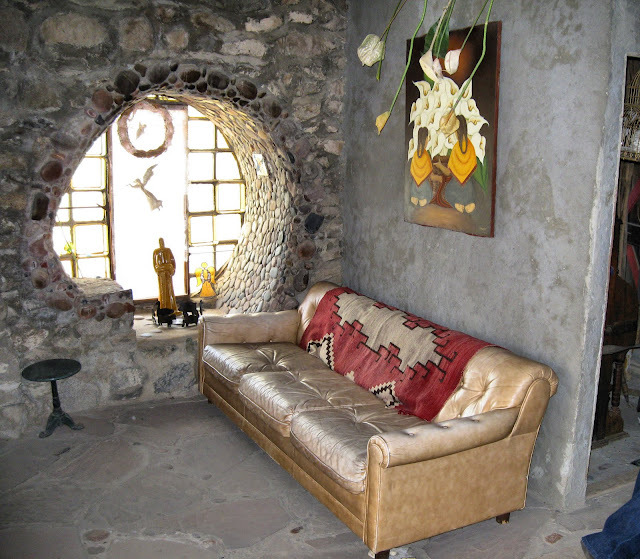 Contemporary artists in the Trash Can School could take inspiration from this pioneer who used an amazing array of found objects in creating what is actually a colossal, crazy-quilt sculpture rising up from the gentle slopes of the Arizona desert. 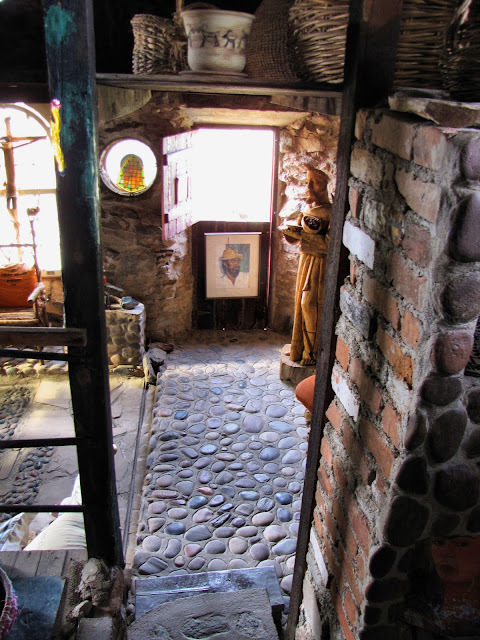 Stones, river rocks and rubble, some handmade bricks, salvaged antique "clinker" bricks (malformed and discarded in the 20s, but coveted and pricey today), auto parts from his own and others' vehicles, various junk from the dump next door, old railroad tracks from the mine and telephone poles all went into this dwelling which is rumored to be held together with some mortar, cement, calcium and a dash of goat's milk! Decorative finishing touches consisted of ceramic tiles imbedded in the walls and walkways, old fashioned square glass dishes used for windowpanes, old wagon wheels here and there, many Native American artifacts plus lots of just plain oddball artwork, paintings and animal sculptures surprising you in nooks and crannies everywhere. Gulley went on scavenging treks around the Southwest and Mexico to gather many of these adornments and lots of it has been added during the many year's of daughter Mary Lou's tenure. 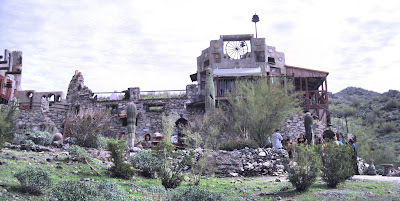 Gulley's architectural "plan" seemed to be spontaneous and meandering, scattering 18 rooms and 13 fireplaces up and down three levels of the naturally occurring slopes of his desert property. Each level required its own entryway as there are no interior connecting stairways. 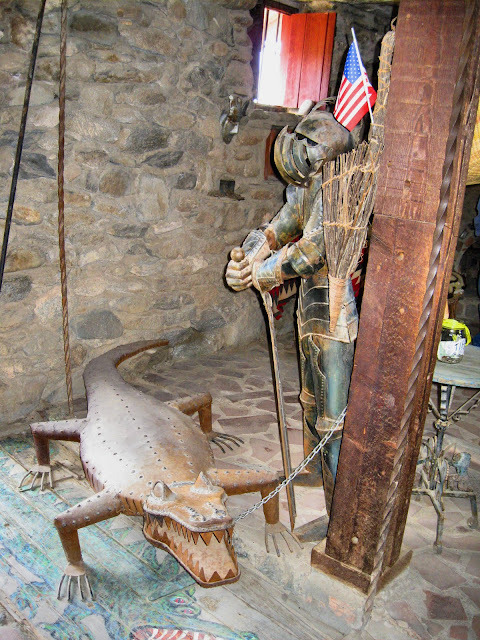 Various rooms are curiosities rather than what you would expect in a normal household: a Cantina with its bar made from a covered wagon sawed in half; a Wedding Chapel which hosted many nuptials over the years, though now discontinued; and a Dungeon complete with a metal alligator "guarding" a trap door that led to hidden treasures, as the story goes. Outside accoutrements include a "Wishing Well" on the level directly over the Cantina where you could both holler down your order and get your drink of choice hoisted up to enjoy away from the bar itself, as you gazed at the spectacular vistas surrounding the castle. Could a person live in this place? 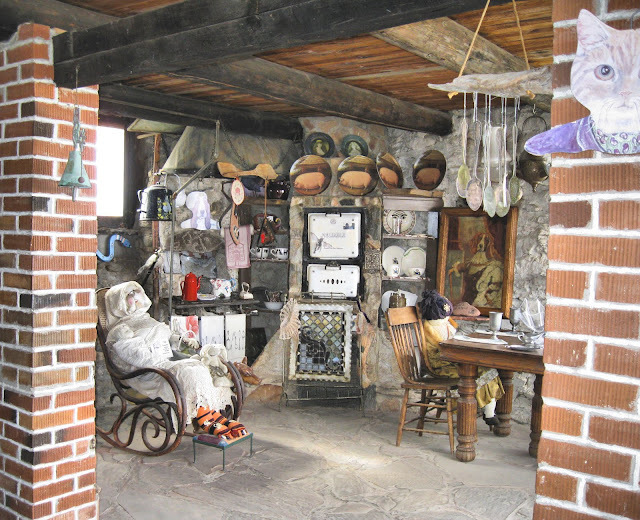 It was very rustic with no electricity or plumbing, but Gulley did live there as he was building it with a variety of guest rooms, huge kitchen with window walls looking out onto the beautiful landscape, storage rooms, many sitting areas, fireplaces, outdoor vantage points ... almost like a hotel, a place to entertain. 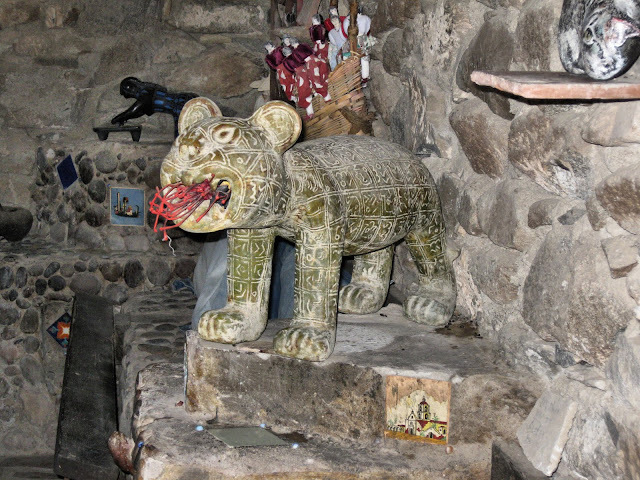 He lived in it until he died in 1945, not from Tuberculosis, but either from cancer or, some say, from an infection caused by a cactus needle that pierced his abdomen when he fell while on one of his desert treks perhaps. 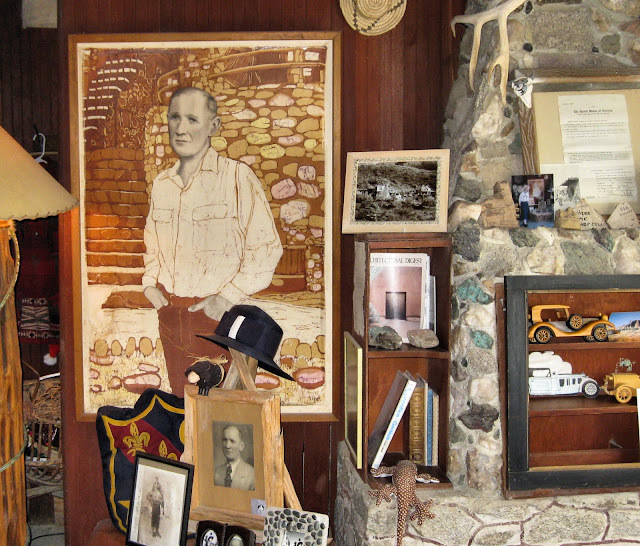 After being notified of Gulley's death and their inheritance, his family came to Arizona and fell in love with the unconventional place, immediately moving in and making it their permanent home. 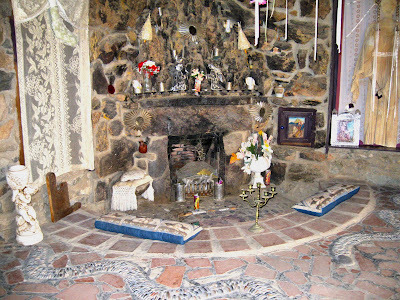 His wife, Fran, died in 1972, but his daughter, Mary Lou, now in her early eighties, lives there still as of February, 2010. 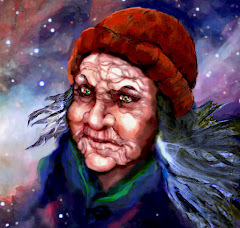 The story of mother and daughter is well known, and they both have proven to be extremely remarkable women, living with no amenities when they first arrived, in what seems more like a stone fortress than a dwelling. 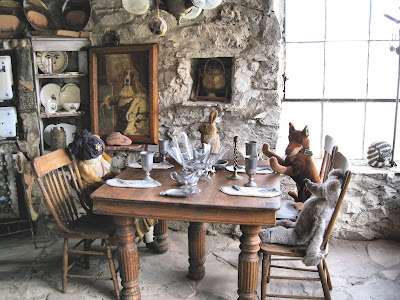 They braved the elements, the critters and even some contrary people while making a living by giving tours of their home, working up to as many as 20,000 people per year. 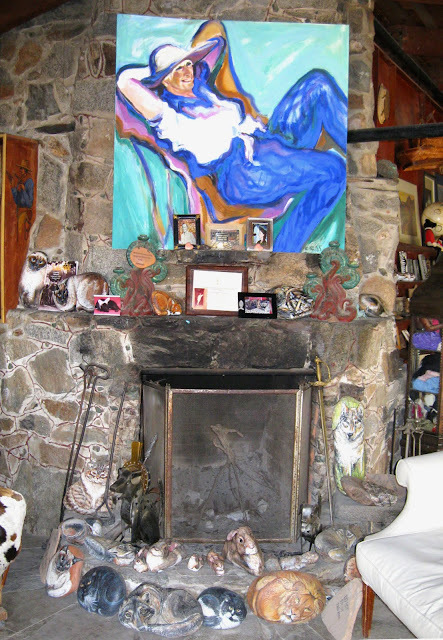 Mary Lou continued her father's artistry with the addition of furnishings, artwork and many of her own paintings of people and animals, especially cats, on canvas, rocks and pillows, plus sculptures and decorative objects and tableaux all throughout the rambling structure and environs. To this day she reveres her father's memory and treasures her 64 years of living in the castle he built for her. So ... was Boyce Luther Gulley, undisputed master artisan, also a "conscientious deserter" perhaps? A "free spirit" who might not have been able to deal with the demands of marriage and fatherhood? If so, he spent his time certainly thinking of his daughter, if not actually being with her. Did he develop a group of friends over the fifteen years of working on his legacy? Since his Cantina was created during the Prohibition era (which ended in 1933), do you think he and his cronies might have enjoyed some great times together, drinking forbidden spirits in the rather hidden castle "Speakeasy"? Could this be one way he earned a living both during Prohibition and beyond? 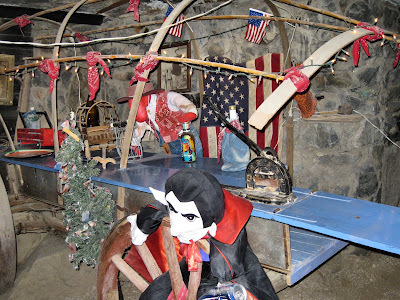 Visit The Mystery Castle on Thursdays, Fridays, Saturdays and Sundays from 11am until 4pm. Located at 600 E. Mineral Road in Phoenix, Arizona in the foothills of South Mountain Park. Phone 602-268-1581 for exact directions. Admission $5 per person, cash only.